The windows not only serve to give our home the necessary amount of natural light, they are also important elements in home decor, and thus become a very attractive visual point. However, many neglect this important part in the decoration of our spaces, so in this post we will give you some ideas of how to decorate the windows of our homes. Before you think of decorating the windows, it’s important to give proper maintenance, it will not help some nice curtains in a window abused. Next step, find the style you choose for each window, and this will depend on the overall decor of the area to decorate, because we have to take into account the colors of the furniture, walls, and others. The first recommendation is by not reloading the windows with heavy curtains. The minimalism and simplicity as decorative tendency will always be the smartest choice, and therefore is also present in the window decorations and choosing the curtains. Something that can bail us to decorate is to have at least two pairs of curtains to switch between warm and cold seasons. Lightweight fabrics prints and colors or cool in summer and heavy fabrics with bright colors for winter. However, it is the choice of curtains for winter or summer, these fabrics should allow light to enter without problems. * In the kitchen windows can choose classic or rustic shades and lace or thematic patterns. For avant-garde kitchens can choose blinds that match the furniture and the color of the walls. * For curtains in the windows of the bathrooms should use moisture-resistant fabrics, you can even buy fabric with PVC curtains or using the same you would use in showers or baths. * If the bedroom is, we must first distinguish whether it is for a child’s bedroom, young or adult. With children we recommend using blinds or curtains light cotton, for the convenience it offers in its washing and resistance holds. 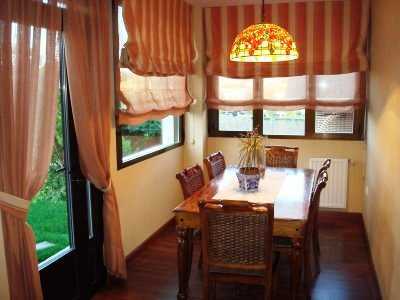 * The curtains in the bedroom blinds juveniles can be cotton and bold solid colors. It will look more current, fashionable and can be consistent with the personality of the owner of the room with a mix of colors and favorite items. * The bedroom of adults may have a romantic if a marriage is about. Curtains of silk, satin or satin, in colors like pink, red or green, can give a very exotic air to the room. * If we talk of couples moderate conservative or adults, we can choose something heavy curtains and greater volume. This will get a more intimate and personal, it can vary with the choice of colors used. * In the living and dining rooms does not change anything, laden environments for the classics, and for modern minimalist. We must also consider the size of the pieces to be decorated, for example, if the dining room is small or lightweight fabrics choose and simple designs, while for larger spaces in size must recharge slightly curtains. With these ideas are lost on how to decorate the windows of your home, as we are sure you’ll find what you need for your home without spending too pressing need to decorate as you wanted and as it should, since any shortage is solved much imagination and dedication. Good luck with your decor, and the next.